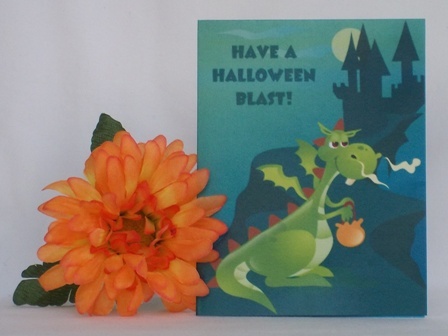 For your paper card making ideas, consider a card making software program to make Halloween card designs and to help inspire you on other handmade card ideas. 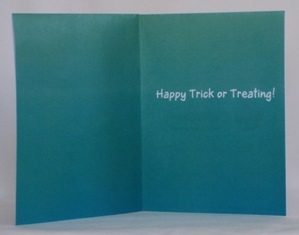 This Halloween greeting card was created using an existing template from the software program called Ecard Wizard. 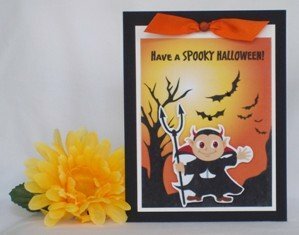 The software program is easy to use, especially if you select one of the many templates when making Halloween cards. Homemade Halloween cards don't have to be complicated. To make a Halloween card using an existing template on Ecard Wizard, you first click on the button that says "Template". Then select the Halloween category. You can then pick a design you like. The paper fold is already set up in the template so you can make Halloween cards with a quarter or half fold, depending on the template that you choose. After you pick your happy Halloween card design, just print it out on a color printer. 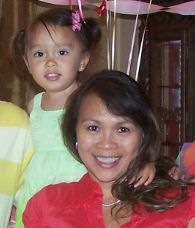 I think colored laser printers work the best since the colors print out more vivid and bright. After you print it out, you'll see the 4 sections of your card on the printout; the front, back and insides of the card. For this card, I folded it in half twice. After it's folded twice, trim the card so that the white, excess border is removed. For your handmade card making projects using Ecard Wizard, you can customize the sentiment and replace what's on the existing template with your own message. That's what's great about the program is that it's flexible. Halloween card ideas can be as simple as printing them up, folding and then trimming them or you can make them a little bit more interesting like I did for this handmade Halloween card. For this Halloween card making project, I used an existing template but removed the image of the vampire. 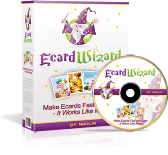 This is a great feature to have on a card making software program, like Ecard Wizard, since the templates have layers made up of a background, text and an image. And if you want to edit each layer of your homemade greeting card ideas you can switch it out for another background, text or image. The printout has 4 four sections so I trimmed the front of the card and placed it over white cardstock paper so that the white paper created a frame. The white frame helps the image stand out against black paper. I printed the vampire image on a blank page and carefully cut it out. I then used added foam tape to the back and adhere it to the front of the card. You can create your own background and replace the existing template background with yours to make even more unique cards for Halloween. I love the Ecard Wizard software program and will be making more handmade Halloween cards as well as other homemade greeting cards. This program even lets you make ecards to email to family and friends.